First off, let me say that I am a huge fan of Compassion. I’ve been supporting you financially for almost ten years, and I love what you do. You work to meet both the spiritual and physical needs of kids in other countries. Not only do you teach people about Jesus, but you offer food, shelter, and education. And you do it efficiently. When I look at your self-reported financial figures, they are really quite impressive. 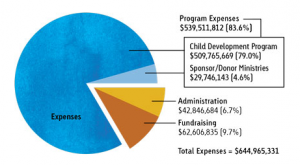 You claim to give a huge portion of your revenue (83.6%) to “Program Expenses” and most of that goes directly into your Child Development Programming. Now beyond these metrics, the numbers get a little more vague as to what is considered “Program Expenses”, but generally speaking Compassion seems to be a highly efficient organization with regards to your revenue. But there is one area that you may want to reevaluate: the amount of wasted money you spend on marketing. As someone who comes from a marketing background, I know that marketing is difficult. It is challenging to raise funds. You need to continually develop relationships with donors. Especially for an organization the size of Compassion, you have a lot of ground to cover and a (relatively) small budget to do it. Now I don’t have any actual data, but I’m guessing that for many years (like primarily the 90s and early 2000s) mailings were your bread and butter for keeping in contact with people. And your mailings always looked good. They always had the sad eyes of some kid in Africa who really needed help. The design was always good. And I’m sure you received a positive response from them. But mailings are expensive. I mean, in 2014 the postage rate is up to $0.48 a letter (according to Stamps.com). Even a postcard is going to be $0.34. Plus there’s all the printing costs of labels and (especially the full color) inserts. I wouldn’t be surprised if it costs you upwards of $0.75 per item to send. And you send thousands (I have no idea how many thousands, but probably hundreds of thousands if not millions) of these every year. Now cost isn’t a huge factor if you’re getting a good return on your investment. And I’m willing to bet that you are. The problem is that many people (like myself) throw your letters away as soon as they get them. Here is something to remember: I ALREADY GIVE YOU MONEY!!! And I’m not giving you any more because you sent a postcard. Some people might. I will not. So why don’t you create a way for me to opt-out of all these mailings? It’s not that I don’t care. I do. But I don’t want you to waste my donation money sending me stuff to ask for more money. You allow me to opt-out of emails. Why can’t I opt out of mailings? I’ve looked for the opt-out button on your site – maybe you have one somewhere – but I can’t find it. And I live on the internet. If I can’t find it, most people won’t find it. Then you also send me a paper receipt for everything I give. I’m fine with email receipts. I really am. No need to print and send all of these. If you allowed opt-outs, I would personally save you probably $15-20 per year. Now that might not seem like much, but multiply that over 100,000 donors and you’d have a ton more money to dump back into marketing in other, more profitable areas or even give it back to your key programs. I’d like that. And the technology exists. There are huge data management and customer relationship platforms that allow you to manage individual users. They allow you to target specific emails, mailings, and messaging while allowing people to opt-out of stuff they don’t want to get. And you’re big enough that you should have this technology and be using it. If you were the local Boy Scout troop with a $500 budget, I’d understand, but you have well over half a billion dollars of revenue. It’s time to put on your big boy marketing pants. Oh boy, the website. There are some really cool things about your site. It still looks like it’s from 2003 and isn’t responsive, but I can overlook that. It explains what you do and why you care. It gives visitors all the relevant information. That is good. But the giving portion of your website is…well…awful. Like I want to poke my eyes out every time I use it bad. At least it works though (most of the time). So that’s one you have up on healthcare.gov. Seriously? I’ve been giving to you for nearly a decade, and you can’t remember who I am? You don’t even know my name? That hurts. It really hurts. Fortunately, I’ve saved a lot of this relevant information using a browser plug-in, so I can zip through this part pretty quick. Then I get to this box. This box is the bane of my existence. I’ve been bounced back to this form a hundred times for forgetting to fill this box out. All kidding aside, you should have all of this data saved into your system anyway. On top of that your web analytics should be able to tell where I came from and save this data for later use. 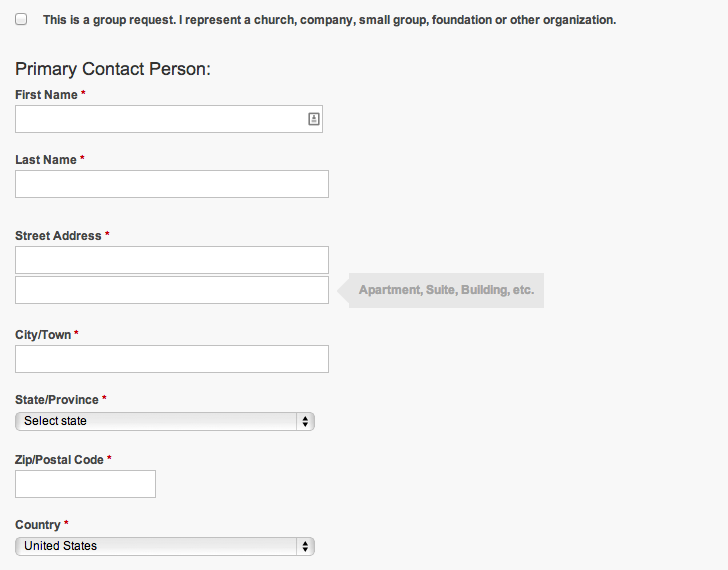 You should have an entire profile on me, and that should be reflected on this form. I’m asking you to collect data on me!!! Google, Facebook, Twitter, Amazon, and the NSA all do it. You should too. Especially when I offer to give it to you. It gives you the option to pay by bank account or credit card. Again, none of my information is saved, so I need to dig my credit card out of my wallet (which more often than not happens to be in the other room) to give you all my information…again. I’m also fully aware that more of my donation actually goes to Compassion if I use my bank account, but really, who memorizes all their routing and bank account info? I’ve put it in before…but it doesn’t save. Imagine the 2% back on every transaction that Visa takes just by saving my bank account info. A whopping 2% is better than most credit card rebates! I’m certain that if Compassion saved a lot of this info, you’d see a huge increase in the number of successful transactions and a reduction in the number of abandonments during the donation process. I’d bet $100 on that instantly. Take a look at Amazon. I have several billing addresses, shipping addresses, and several credit cards saved on that site. I can place an order in about 10 seconds. It’s amazing. I should be able to donate in 10 seconds. And I know you already have all that information saved because I can set up recurring payments. Recurring payments require a saved payment method. 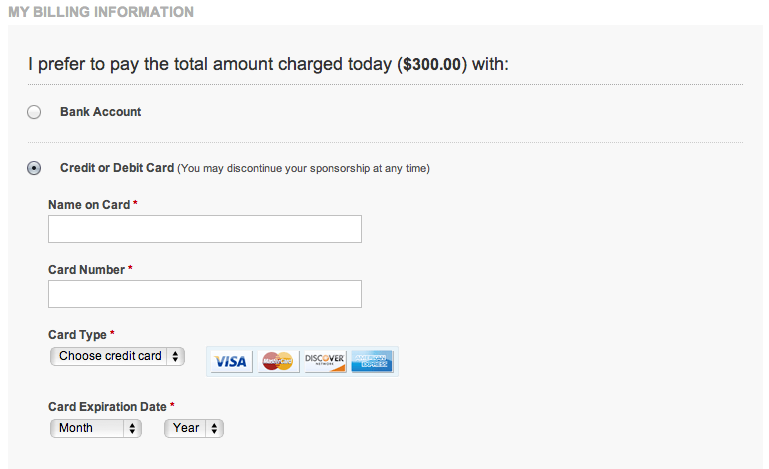 But I don’t like recurring payments. I like to actually give based on my financial situation at the moment, so why do you make it so difficult? Just fill in my info! Compassion, you are doing good work, and thus far your focus has continually been on minimizing costs while maximizing impact. Let’s keep that going. I respect your organization, but your marketing is stuck in 2003. The world is changing fast and there are new opportunities for data and UX driven marketing that just weren’t there 10 years ago. It’s time to get a marketing team that understands the web, data, and analytics. The return will more than pay for itself. And this doesn’t mean you stop doing what you’ve always done with mailings and other “traditional” forms of marketing. Good data will just help you do it better. Isn’t that what you want? At the time of this writing, you’ve just posted several marketing related jobs on your site, but none of them have to do with data, analytics, conversion rate optimization, or any of the other data driving marketing opportunities. The spray-and-pray marketing tactics you’ve used to promote your cause worked great for years, but it’s time to up your game. As a financial partner, I’d feel a lot better knowing that you’re taking your marketing efficiency seriously. But as always, keep doing good work. So I read a lot of stuff, but this week I’ve stumbled on a few really good articles. I just though I’d share. I’m sure there are many more. But these were the best ones for this week. This morning in Fort Collins was the Tour de Fat. Basically a bunch of people from the town (by a bunch, I mean like 20,000) get together to ride around, drink beer, and make new friends. Quite honestly, it was awesome. I loved it. At first I wasn’t going to participate. But then I thought, “Why not?” And I had no good answer, so I did it. Once I decided to participate, I had to figure out what I wanted to be. 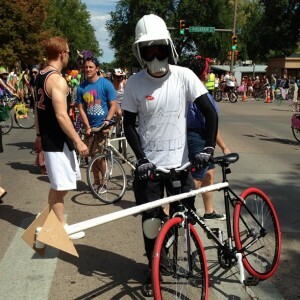 So I did what any nerd would do: I Googled “bike costume”. Low and behold, the first result was a Stormtrooper on a Speeder Bike (technically this would make him a Scout Trooper for all you Star Wars fans). Win! That’s what I wanted to be. Of course the Scout Trooper outfit is significantly different from a traditional Stormtrooper. And besides, I just didn’t want to go out a buy a costume. What’s the fun in that? So after a trip to Toys R Us and a quick stop by Home Depot, I had everything that I needed. Now fun the started. I really had no plan. I just made it up as I went. Cutting. Pasting. Adding zip ties. Taping. I was just building. And that time was the best, most relaxing two hours I’ve had in months. Seriously. Months. You see there is something about building something that makes me…well….me. Getting lost in the problem. Seeing what an object can be and then making it happen. It’s the same feeling some people get when they talk about the outdoors. But to be honest, the outdoors doesn’t do much for me. I mean, I love it. It’s beautiful. I live in perhaps one of the most beautiful states in the country. Other people love to spend an afternoon on the beach. I love the beach too. But after about 15 seconds in the sun, I’m ready for something else. I think creating teaches us more about our creator. I think that there is an insatiable desire in all of us to make something. That somehow, through the act of creating we are worshipping our creator. Imitation is the sincerest form of flattery. Stop and think about being creative for just a minute. Creativity can be a state of being. It’s that moment when you’re so far in the zone that you don’t even realize the fun that you are having. You are so focused on what is happening that you forget everything else. And that’s where I was last night. For the first time in a long time. It was me, a hardhat, a mask, some cardboard, and some zip ties. And it was by no means a masterpiece. It looks Ok. Just Ok. But I wouldn’t trade that experience for anything. When’s the last time you got lost in building something?